Home / News / What are UV Rays and What Causes Skin Cancer? What are UV Rays and What Causes Skin Cancer? 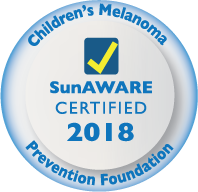 Exposure to ultraviolet (UV) rays is the biggest risk factor for most skin cancers, with approximately 99% of non-melanoma skin cancers being caused by overexposure. How are we exposed to UV rays? The most common way is through sunlight, but people who spend time in tanning beds or under tanning lights will also receive ample exposure to UV rays. While UV rays make up just a tiny portion of the rays of the sun, they can do a lot of damage to our skin, damaging the skin cells. Skin cancers begin to form when damage from UV rays affects the DNA of genes which control the growth of your skin cells. It’s important to protect yourself from UV rays whenever possible, such as wearing sunscreen when out, or golf shirts with UV protection. - UVA rays – These rays age your skin cells and can actually damage the DNA, which is why they are linked to skin damage such as wrinkles. These rays are also thought to play a role in some skin cancers, and are present in most tanning beds. - UVB rays – These carry a bit more energy than UVA rays, and as a result, they damage skin cells’ DNA directly. These are the main rays that cause sunburns, and they are believed to be the biggest cause of most skin cancers. There are a few things you can do to help protect yourself from UV rays as much as possible. One thing is to understand when UV rays are strongest, so you can take extra precautions. UV rays are stronger during the spring and summer months, and are especially strong between 10 AM – 4 PM. If you are outside during these times, wear protective clothing and sunscreen at all times, reapplying frequently. UV rays can also bounce off surfaces such as water, sand, or snow, which can increase your exposure to their rays. Many people think that if they are underwater they will not be impacted by the UV rays of the sun, but in truth, they can be more harmful than ever. If you are swimming, wear your Italian swimsuits and make sure you are taking breaks, especially to get into the shade. Even on a cloudy day, UV rays from the sun can get through and burn you, making it vital to protect yourself every time you go outside, especially if you are out frequently or live in a high altitude area, where more UV rays reach the ground than at lower elevations. At 2-DG, we are passionate about helping people stay protected from the sun, which is why our fashionable clothes come with SPF 50+ UV protection. For your next day of work, a trip to the golf course, or simply for a safe, fashionable clothing item for everyday use, check out our men’s clothing and women’s clothing options. Let us know how we can help.